This week at Just Us Girls is a sketch challenge, when I saw this I immediately knew what I was going to do. I thought an easel card would be perfect with this sketch. 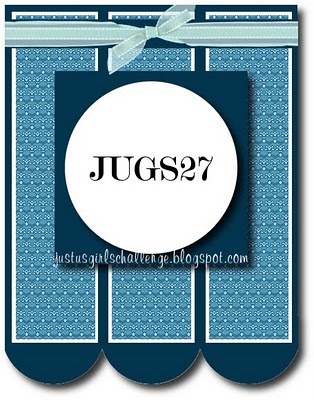 The image is a digi stamp from Squigglefly, go over and have a look! The die cuts are from Spellbinder and the flowers are Prima. Cute easel card. Thanks for sharing with us this week at For Fun Challenges. Very pretty. Thanks for playing at Just Add Ink! Gorgeous card! Very pretty purple color combo both inside & out! I like your take on this weeks sketch - great job with combining all these challenges - thanks for playing along with Just Us Girls! Hope to see you Saturday for an all new challenge! A very sweet card. Thanks for playing at Just Add Ink! Hi hun. Great card and thanks for joining us here at OSAAT. I hope you'll come back and check out our winners and our next challenge on Sunday. Stunning - so pretty in purple. great details and a super easel card. Thanks so much for playing along with Just Us Girls this week. Wasn’t this a great sketch? We appreciate your participation and support. :-) Hope to see you again next week. cute! thanks so much for playing along with PIO! Lovely card! Love the colors (I LOVE purple!). Thanks so much for piling it on with us! Wow, absolutely fabulous design using the Spellbinders dies. Your colors and coloring are wonderful also! Great job on the easel card challenge. So happy you could have some fun with Pile it On this week. LOVE this card inside and out! The colors are great! LOVE the spellbinders die cuts! girl, you were right on the money when you used your white pen to go around the items... it add a little something! Thanks for playing w/ us at Pile It On! Challenge.